The Most Complete Ancient Discovery. 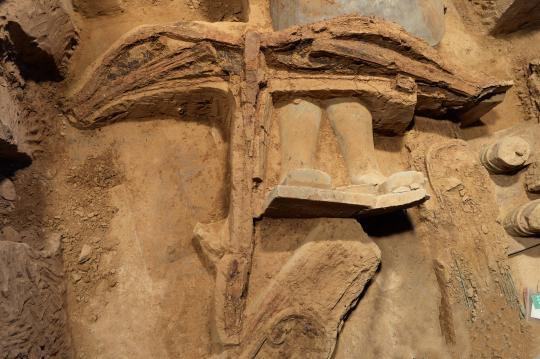 Archaeologists have recently discovered the most complete ancient crossbow to date in the terracotta army pit in Xi’an, Shaanxi province. Among hundreds of pieces of crossbows unearthed in the past, this one is said to be the best preserved in general, with 145 cm arch and 130 cm bow string. 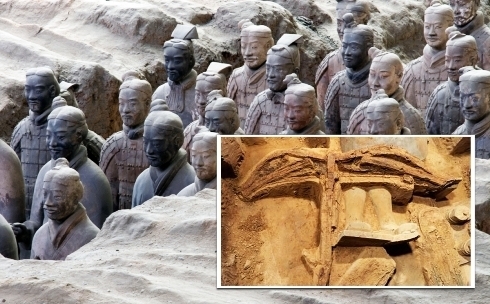 The bow string has a smooth surface which experts believe to be made of animal tendon instead of fabric and the trigger mechanism is made of bronze, according to Shen Maosheng, head of the archaeological team. When the sticks were dusted off three holes were found equidistant from each other, and it was concluded that they were probably used to hang up ropes that were fastened to the crossbows when they were not in use. It was a great way to keep the arch and string in shape and thus maintaining their power in the long run, “Shen said. Besides, Qing was practical to help fix the crossbows during transportation.” . 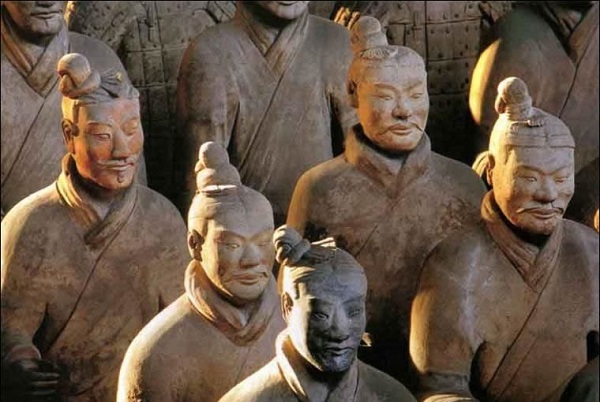 The best crossbows ‘ shooting range could double that of an AK 47, reaching almost 8oo m, Yuan Zhongyi former curator of Museum of Qin Terra -cotta Warriors explained. This Minoan Linear B Tablet PY 64l is by far the most difficult one I have had to translate. 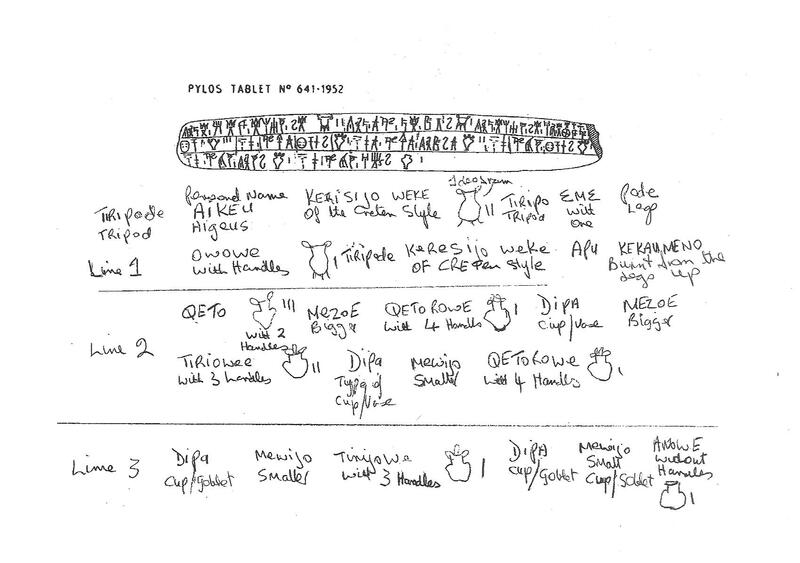 It was the first ever Linear B tablet which Michael Ventris deciphered in 1952. I was in my teen years then and knew nothing of his great achievement and in fact nothing about the Linear B Ancient script writings whatsoever. Aigeus a worker is making tripods of the Cretan style. 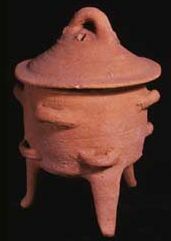 Tripod Cooking pot from Knossos. l Tripod with a single handle on one foot..
l Tripod with the legs burnt from the legs up. The Prince of Lilies (Sonnet) Knossos Fresco 1500 BCE. I found this SONNET written by a Graduate Student archaeologist while she was visiting the Ashmolean Museum at Oxford I think she was supposed to be writing some essays, and included this Sonnet, which I find rather appropriate seeing that I am studying Linear B. Her name is Sarah Hawley. Thank you Sarah !. Such poetry sends joy throughout my soul ! I much prefer my Mycenaean dream.